Douglasville, Georgia –The Cultural Arts Council Douglasville/Douglas County has celebrated the coming of summer with a Taste of Douglasville festivity and this year, the 25th festival, is no different. On Saturday, May 19th from 11 am -5 pm the downtown Douglasville area will be full of citizens and visitors enjoying warm weather, eating great food, enjoying local performers, visiting community booths aplenty, all alongside several thousand new friends. A special Kids Korner will keep the smallest citizens entertained and active. 12,000 people attended TASTE of DOUGLASVILLE last year, continuing its tradition as the one-day biggest festival in town! In 2014, Kayla visited Honduras with her mom and sister bringing clothes, toys, toothpaste, mouthwash, shoes, and lotion to a local orphanage. Kayla got the chance to learn their culture, and how they made jewelry for their loved ones. Kayla stated, “The kids lived at the orphanage because they were treated really bad at home. To me, they were just my friends who taught me how to speak Spanish, how to cook tortillas and how to play soccer. They showed me how they grow their own food.” She decided that she wanted to help her friends, and now donates portions of her proceeds back to the orphanage because she wants to “help them have more like me” Kayla stated. 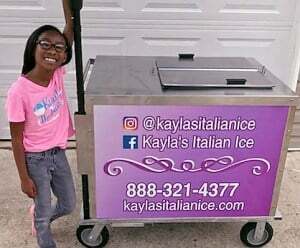 Kayla hopes to have her Italian Ice in stores around the world and teach other kids how to start their own business venture. She wants to remind people to have fun and do things from the heart and it won’t feel so much like work. Kaylas’ Italian Ice and other food vendors will be serving up samples and tastes of a variety of cuisines such as Barbecue, Italian, Louisiana cuisine, pizza, Mexican, and desserts of all sorts. This year food vendors include, Carrabba’s, Italian Grill, Cupcakes by Dezigns, Fabiano’s Pizzeria, Farmers Table, Gabe’s Downtown, Golden Krust Caribbean Bakery & Grill, Irish Bred Pub, Kayla’s Italian Ice, Kona Ice, La Hacienda, Olive Garden, Plates on the Square, Rio’s Italian Ice, Shane’s Rib Shack, Sprinkles, Taste of Philly, The Twisted Pickle, The Vine Café and Market, Taco Mac, and Lit Up BBQ. Taste is both a sample for attendees and a competition amongst the restaurants. Providing ambience while attendees eat and shop and visit will be entertainment at the O’Neal Plaza Stage which will have local performers playing non-stop music, from 11:15 am – 4:45 pm featuring all styles of music from country to jazz, folk to hip-hop. Keeping the children entertained will be the Kid’s Korner showcasing the Master Gardeners, the popular Water Works display, charades, ThunderZone bowling, face painting, corn hole fun, and much more to delight the kids. Taste of Douglasville also allows citizens to “sample” area arts and crafts and local business. In the arts and craft field there are over 20 booths signed up with beautiful jewelry, wood crafts, pottery and hair bows to tempt attendees. This year over 25 community booths signed up, representing everything from health care products to clothes, from financial advice to beauty products, and cellphones to children’s books. Taste of Douglasville 2018 is the Arts Council’s largest fund-raising event and it is the community’s largest one-day party, taking over all of Church Street areas (ample parking, however, is still available in the parking deck). It is free admission to attend this activity-packed event, with food tastes ranging from $1 – $4 on Saturday, May 19th from 11 am – 5 pm in downtown Douglasville. For further information, call 770-949-2787 or go to www.artsdouglas.org.